Recent research [“study”] featured in the Wall Street Journal argues that stock based incentives do not incentivize long-term company performance. Pay Governance disagrees with this conclusion. The study conclusion is based on the assumption that larger stock grants [above the median of the study companies] should be more motivational than smaller stock grants, and thus the magnitude of total CEO pay opportunity should be positively correlated with company performance. The study found a lack of alignment between the magnitude of CEO pay opportunity and 10-year company TSR for hundreds of companies. However, the pay opportunity disclosed in the summary compensation table is generally set based on competitive market median data, and is not typically adjusted annually to reflect short-term company performance. Thus, the assumption underlying the study is flawed. The motivational power of stock grants [performance shares, stock options, and RSUs] lies in the change in value of these grants due to financial and stock price performance after the award date. 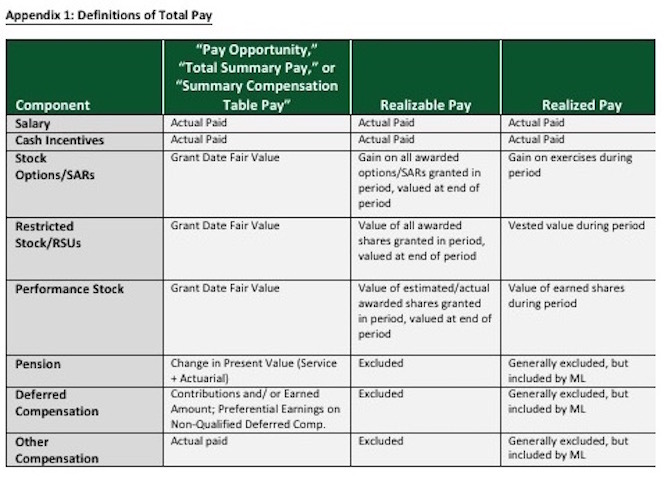 Realizable pay and realized pay measure the magnitude of executive pay by including the in-the-money value of stock awards after grant to test alignment with shareholder returns (TSR). This is a more valid approach than using pay opportunity. Pay Governance’s research on realizable pay-for-performance alignment shows strong alignment between CEO pay and TSR, and academic research on realized pay also finds strong correlation with TSR. More than ever, we believe that companies must continue to grant competitive levels of equity incentive awards, and monitor the alignment of these awards with company TSR after the fact using realizable pay. Recent research1 featured in the Wall Street Journal article, “Best Paid CEOs Run some of the Worst-Performing Companies,”2 questions basic design premises of the public company CEO compensation model in the US. Specifically, the research [“study”] argues that delivering large equity grants — above the median of companies in the study — to CEOs is not an effective way to motivate long-term shareholder value creation (e.g., total shareholder returns). We believe this study is based upon an incorrect premise of executive motivation and an improper measurement of CEO pay. Pay Governance, and others, have found a strong alignment between CEO pay and total shareholder returns (TSR) when pay is correctly measured using realizable or realized pay methods. This is contrary to the primary finding of the study, which is based on the accounting value of equity awards, and not the value realizable or realized after performance and vesting conditions are applied. It is well known among shareholders, their proxy advisors, directors, academics and corporate executives that stock grants [including performance shares, stock options, and RSUs] are highly motivational to executives overall. Pay Governance conducted a preliminary review of the study and the methodology underlying the findings. The researchers state, “In theory, it is the total summary pay figure that is intended to incentivize future performance…” The researchers’ definition of total summary pay is the “Total” column in the Summary Compensation Table required in the proxy. Total summary pay, also known as “pay opportunity,” includes the accounting value of stock awards at grant. The study used pay opportunity to test whether above-median [relative to companies in the study] grants of stock awarded to CEOs create extra levels of motivation. They test whether some compensation committees — effectively half — deliberately make above-market grants of stock to “super-charge” the motivational factor in stock. The researchers conclude that there is no relationship between the magnitude of stock award values for CEOs and company TSR performance. This conclusion is based on flawed assumptions about how companies set pay opportunities combined with their findings of weak correlation between pay opportunity and TSR (i.e., high pay and low TSR; low pay and high TSR). This is not a useful statistical analysis. Our experience, supported by significant proxy research, demonstrates that the vast majority of companies target their pay opportunity levels and stock grants to the median of their carefully selected and highly scrutinized peer groups. Targeting of peer median is contrary to the theory stated in the study regarding the alleged superior motivational power of excessive pay opportunity values. Most compensation committee members believe that targeting executive stock incentives at the median of their peer group creates sufficient motivational power for executives. In fact, the companies in the study’s sample had average TSR of approximately 170% over the 10-year period, or 10% on an annualized basis, which, combined with relative TSR, is an indicator of an effective compensation model. Pay Governance’s research confirms the weak correlation between pay opportunity and TSR since opportunity largely represents pay values before the impact of performance and is primarily targeted to achieve median pay opportunity values. We know that it is the design and structure of equity incentives and the potential change in value of equity incentives after grant that is highly motivational — not the accounting value of stock incentives within the pay opportunity, as the study suggests. Ultimately, stock grants create the alignment between executive pay and shareholder value creation (e.g., TSR) — both up and down. Motivation stems from the ability of management to influence the creation, or destruction, of long-term shareholder value. Virtually all shareholders have endorsed the motivational value of equity compensation awarded to executives, as demonstrated by more than 15,000 highly successful Say on Pay votes over the past 6 years. Further, both ISS and Glass Lewis are supportive of performance-based stock grants. In this challenging economic, political and governance environment, we believe that compensation committees need to be particularly effective in balancing the inherent tension between motivating and retaining company leadership and aligning compensation with shareholder interests. Our research and experience demonstrate that this is best achieved through properly designed and competitively-determined grants of stock and cash incentives, and most effectively monitored after-the-fact using realizable pay tests. 1. Are CEOs Paid for Performance by Ric Marshall and Linda-Eling Lee. MSCI. July 2016. 2. Best Paid CEOs Run some of the Worst-Performing Companies by Theo Francis. Wall Street Journal. July 25, 2016. 3. CEO Pay Well Aligned with Company Performance: Pay Governance’s 2015 Study of S&P 500 CEO Realizable Pay and Company TSR by Ira Kay, et al. Pay Governance. February 4, 2016. 4. Wall Street and Main Street: What Contributes to the Rise in the Highest Incomes? by Steven Kaplan and Joshua Rauh. National Bureau of Economic Research. July 2007. General questions about this Viewpoint can be directed to Managing Partners Ira Kay or Lane Ringlee by email at: ira.kay@paygovernance.com or lane.ringlee@paygovernance.com.